Multi-car garage designs such as 4-car garage plans and larger detached garages are designed for the storage for four or more cars or other automobiles. They come in a wide range of sizes and styles ensuring you’ll find just the right one to fit your lot and blend nicely with your home. Some architectural styles include country, Craftsman and traditional. The façades of multi-car garage plans typically feature finishes such as horizontal siding, shakes, brick and stone, adding character to each design. The exteriors can be simple, having little detail, or more decorative, sporting intricate details and other extras like covered porches, dormers and stylish overhead doors. Furthermore, various rooflines and different overhead door combinations contribute to a greater selection of designs. Multiple car designs like 4-car garage plans may offer four or more bays or perhaps two tandem bays accommodating four cars or maybe two automobiles and a boat, trailer or oversized vehicle. Sometimes, these floor plans incorporate deeper bays outfitted with taller doors, just right for storing an RV or camper. Multi-car garages work well for storing the family cars and other storage needs. If you only have two or three cars, use the other bay(s) for motorcycles, ATVs, kayaks, bikes, a golf cart or lawn and garden equipment. You might even want to use one bay for a workshop. Car enthusiasts will find that 4-car and larger garage designs are great for restoring and working on historical and other favorite cars. And if all this isn’t enough, some of these designs incorporate other usable spaces such as a flex room, half or full bath, storage loft or workshop. Not only are multi-car garage plans functional and accommodating, they also will enhance any piece of property and add value to your home. 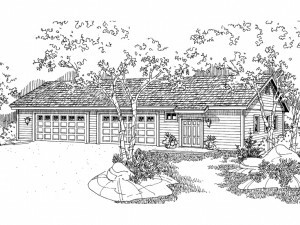 Take a look at these 4-car+ garage plans.